Today, 4th April 2014, MEP Zofija Mazej Kukovič took part in a discussion with high schools students from Ravne na Koroškem, which was organised by Europe Direct Koroška and the A.L.P. Peca organisation. Throughout the discussion, participants were able to familiarise themselves with work in the European Parliament and at the end, they took part in a simulation of the European Parliament, where they were able to contribute their own points of view on some of the issues facing the European Union. Mazej Kukovič told those assembled: ?We must be strong in our conviction that we will be able to survive despite the trials and tribulations of life, just like Voranc?s Meta, who persistently pushed the cart uphill. We face this hill right now in Europe, as everything went downhill after years of economic growth. However, most countries have already recovered by now. Slovenia unfortunately didn?t. Regardless, the current situation holds many hidden opportunities.? During times of hardship, when traditional employment can no longer be counted upon, we must seek out our own opportunities. It is here that the best and most innovative solutions are born. ?Your wonderful and exciting ideas represent new horizons for Slovenia. You are only truly free when you create your own future,? Mazej Kukovič continued, as she presented entrepreneurship as a way forward during these times of high unemployment. ?It doesn?t matter if you don?t succeed right away. The culture in Slovenia is such that people think that an unsuccessful company is the worst thing that can happen to them. In the USA people don?t lose hope, even if at first they don?t succeed and that is because they are used to adapting to the ever-changing environment. Furthermore, their educational system encourages practical knowledge, creativity and audacity; elements that are needed for self-employment. We do not possess such an environment, so we must create one.? 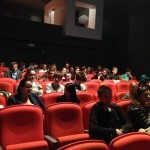 Young participants expressed interest in the state of play of EU-USA cooperation. Mazej Kukovič concluded by responding: ?I?m a member of a committee that takes part in the EU-USA treaty negotiations, which would regulate and strengthen cooperation in each specific sector. Europe and America must come closer together, which can bring a lot of positive results. For example, you cannot just pack up and leave to work in the USA as an architect or a doctor. The goal is to facilitate these processes. High school students from Ravne impressed their counterparts from Brussels with their knowledge on the European Union. During the European Parliament simulation they managed to support their position on current European issues with excellent and strong arguments. We were glad to have been able to work with them!